Canyon Point homes are located in the coastal community of Aliso Viejo. The Canyon Point neighborhood dates back to 1988 the when the first condos were built here. There is a variety of one to two bedroom condos that range in size from 712 to 1,235 square feet of living space. The complex features several three story buildings that features condos located on each level. Higher floors will often offer panoramic hill views. 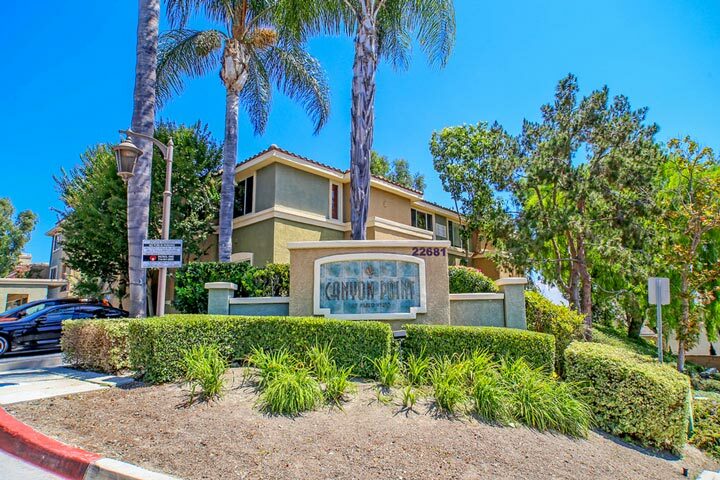 Below are the current Canyon Point condos for sale and for lease in Aliso Viejo. Please contact us at 888-990-7111 with questions regarding this community and any of the properties listed for sale here. The Canyon Point association provides many amenities for residents who live here. This includes a nice community pool, spa, fitness center and clubhouse. There are approximately 124 units located here with ample resident and guest parking. The location is near the Aliso Viejo town center shopping area and a short distance to Oak Grove elementary and Don Juan Avila middle school. There are a total of two association dues paid on a monthly basis here with the condos managed by the Canyon Point homeowners association.